The Razer Blade isn’t just a great gaming laptop, it’s a great laptop, full stop. 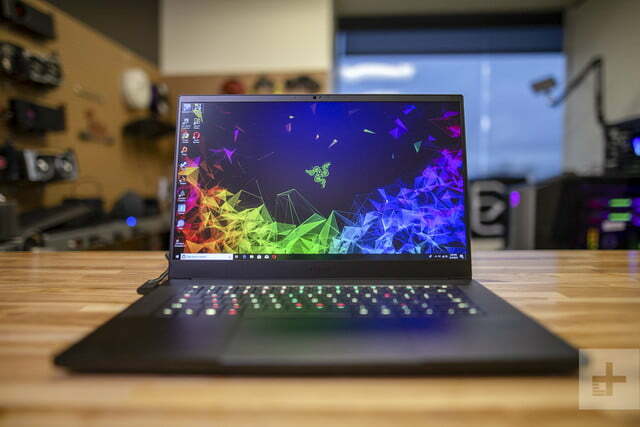 The Razer Blade was my favorite gaming laptop of 2018. It wasn’t the most powerful, and certainly not the most affordable, but it was a laptop that could replace both a gaming PC and a MacBook Pro in one device. That felt special. In 2019, Razer hasn’t changed up the formula. But with the powerful new RTX video cards inside, it should have boosted gaming performance. Our review unit came with an RTX 2070 Max-Q, as well as your typical arrangement of a six-core processor, 16GB of RAM, and a 512GB SSD. The $2,600 price tag is bound to give you some sticker shock, that’s for sure. Still, if you love gaming, and you’re going to pay the big bucks for a gaming laptop, it may as well be one you’ll love. 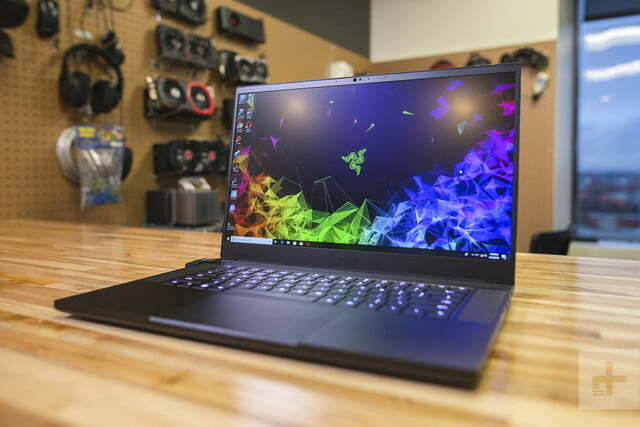 Will you love the Razer Blade? I think so. 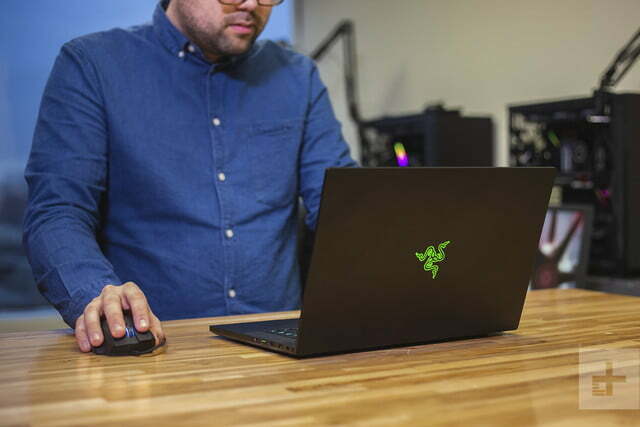 The design of the Razer Blade is where it shines. 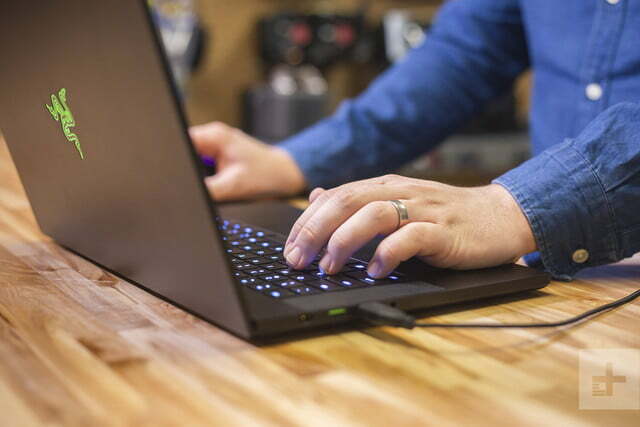 The matte black finish, squared corners, and light-up green Razer logo all remain, and make for the sleekest gaming laptop you’ve seen. You can find thinner gaming laptops, like the MSI GS65, but none look as clean as the Blade. Some gamers may prefer a louder design, but this is exactly what I want in a gaming laptop. My one complaint is the how easy it picks up fingerprints. You don’t have to be eating potato chips to leave grease behind with every touch. At 0.7 inches thick and 4.5 pounds, it’s only a tad less portable than the Dell XPS 15. This time around, Razer has thickened the chassis ever so slightly from last year, but it’s tough to notice unless you have the two models side-by-side. Open it up, and the slick design continues to impressive. 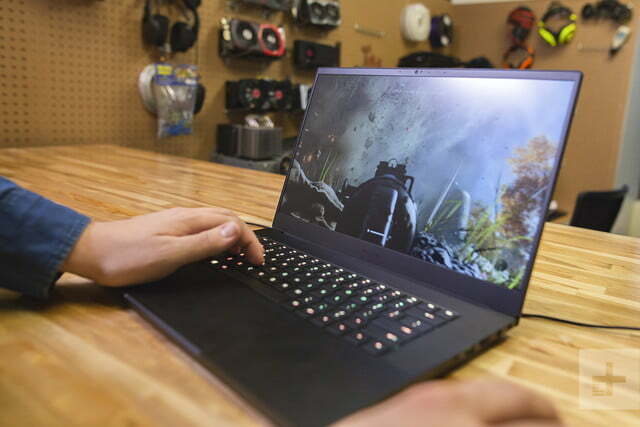 A 4.9mm narrow-edge bezel surrounds the 15.6-inch display, leaving just enough room up top for the webcam and a subtle Razer logo in the chin. 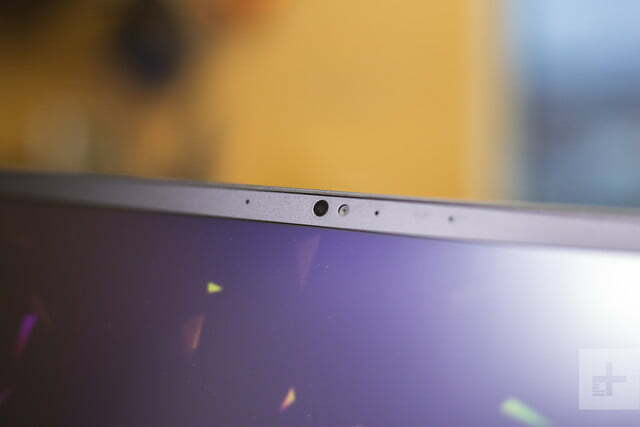 I’m glad Razer left the webcam up top, rather than removing it for thinner borders like on the Asus ROG Zephyrus S. The layout of the keyboard deck is carefully considered so that everything feels like it’s in the right place. Though ours came in black, there’s an option for a Razer’s “Mercury White” variant. It’s only available in the RTX 2060 model (and costs an additional $50), but the light silver colorway feels refreshing, especially for a gaming laptop. Razer’s build quality is second only to Apple’s MacBook Pro. The Blade’s single chunk of machined aluminum is rigid on the edges of the lid and along the keyboard deck. One weak point is the center of the lid, which noticeably gives under pressure. 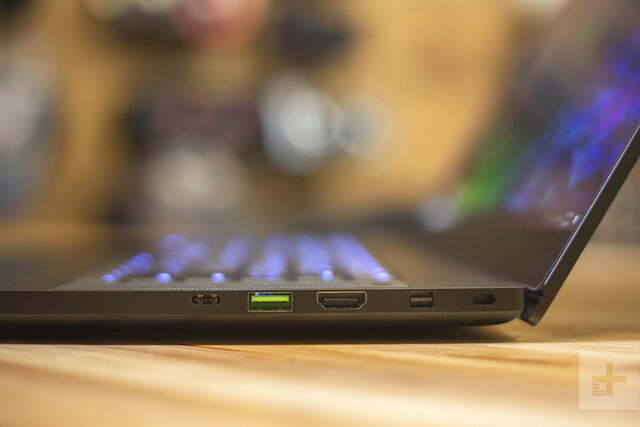 A healthy array of ports line the perimeter of the laptop. You’ll find USB-A, a USB-C Thunderbolt 3, an HDMI port, and mini-DisplayPort. If you want an ethernet port, it’s only available in the “Base Model,” which is a bit thicker and features only GTX 1060 for graphics. The options here provide plenty of room for gaming peripherals, plus a USB-C port for futureproofing purposes. 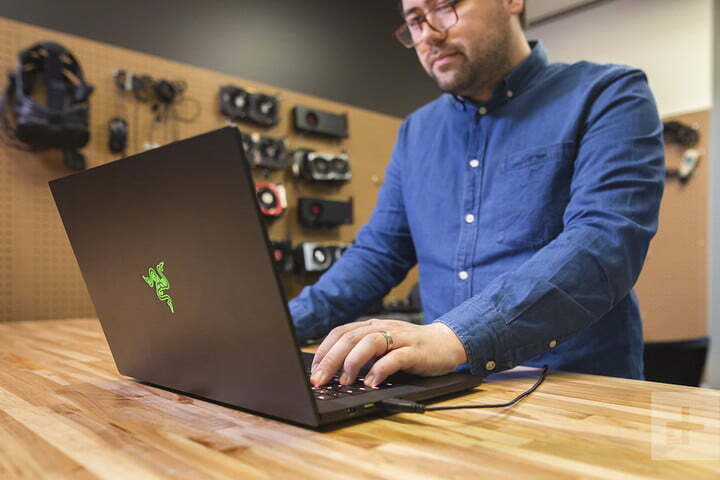 The Thunderbolt 3 port can handle an external graphics card, which Razer has become a cheerleader for with its Razer Core enclosures. 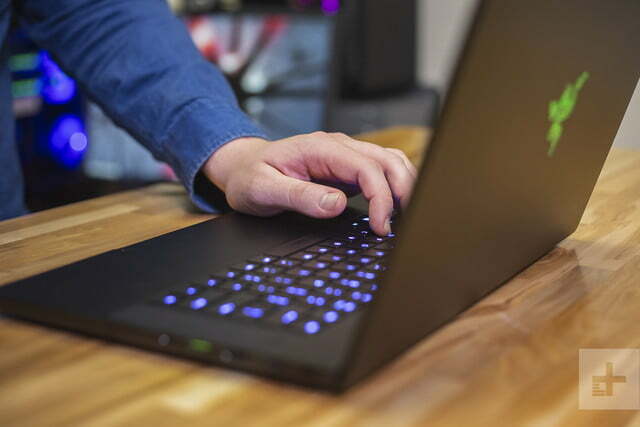 The keyboard and touchpad are standouts on the Razer Blade. 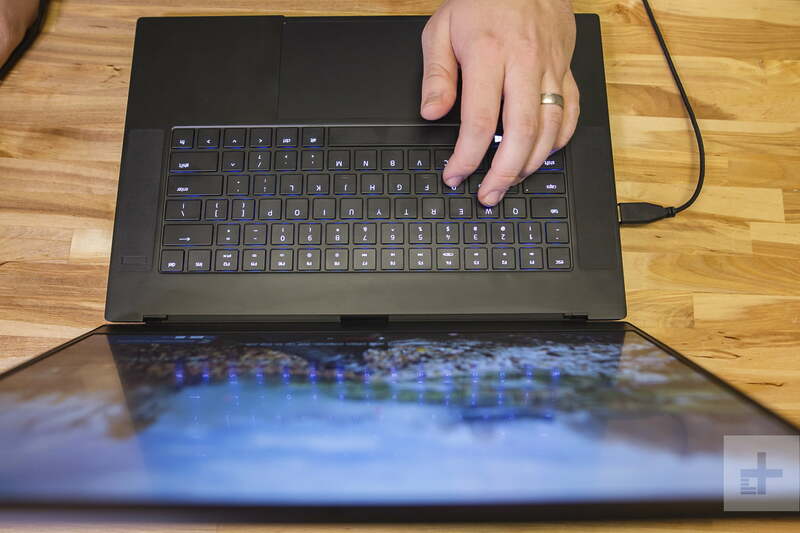 The touchpad is one of the largest you’ll find, nearly matching the size of the 15-inch MacBook Pro. The extra space looks great and offers plenty of room for things like two-finger pinches or four-finger swipes. The tracking is precise, the texture is smooth, and thanks to Windows Precision drivers, gestures work perfectly. All of that is a rare on a gaming laptop, even in this price range. The typing experience is impressive, too. 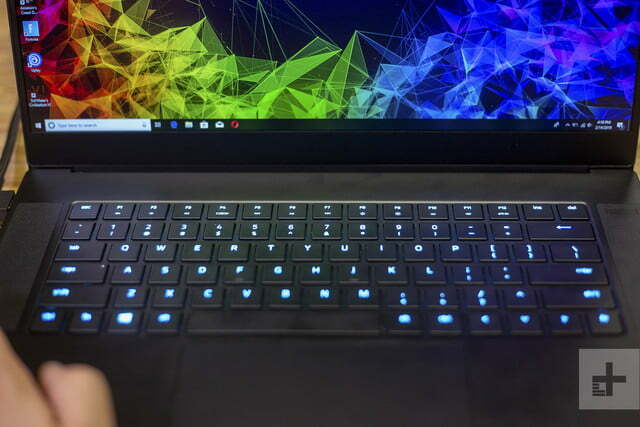 Though not as nice as the mechanical keyboard featured on the Alienware Area-51m or Razer Blade Pro, the Blade’s keyboard feels tactile and responsive. I do have a couple of hang-ups, though. The layout is an issue. I complain about this with every Razer laptop, but the full-sized arrow keys create a stumbling block for fast typing. I’m getting used to it, but having a space between the Shift key and the question mark key creates a learning curve. It’s more forgivable here than it is on the Razer Blade Stealth, since the standard Blade can actually handle games. Gamers need a great display, and the Razer Blade delivers. Razer’s ever-present Chroma RGB lighting has improved this year. It’s as bright and customizable as ever. It’s all easily edited through Razer Synapse, and even comes with an unprecedented fourteen levels of brightness for precise control. What’s new, though? 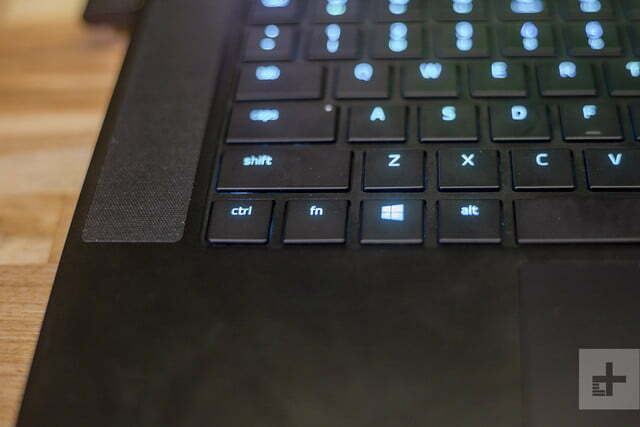 Well, on the previous Blade, the small symbol under each Function key wouldn’t light up when the function key was held down. Now it does. It was a small annoyance if you were in the dark and didn’t have the exact location of the volume button memorized. It’s a subtle change, but I like that Razer is responding to feedback. An infrared Windows Hello camera is another new addition, placed next to the 720p webcam above the display. It’s a small touch, but proves Razer is serious about making the Blade competitive. Gamers need a great display, and the Razer Blade delivers. The 15.6-inch screen is a matte IPS 1080p panel, perfect for keeping away glare even at wide viewing angles. While a 4K model is available, I’m hesitant to recommend it. It’s sharper, but most of us prefer trading a high resolution for higher framerates. The 1080p models include a 144Hz refresh rate, which means you’ll enjoy super-smooth gameplay when you push beyond 60 FPS (frames per second). If you’re into fast-paced competitive games, it’s a must have feature. On top of its performance, the Blade’s display also looks quite nice. It has a decent color gamut and a low average color error. That means colors aren’t just vibrant, they’re also accurate, which is great for content creators of all kinds. It’s not a perfect display, though. Just like last year’s model, the display’s weakest points are contrast and gamma. A contrast ratio of 640:1 isn’t bad, but it falls behind options like the Zephyrus S and the XPS 15. Meanwhile, the 2.0 gamma score means images and video can appear bright and washed-out. Razer has included a decent set of speakers on the Blade, which is always appreciated. They’re forward-firing right from the keyboard deck. You still can’t expect much in terms of bass response, but what’s there is clear and listenable. That’s more than I can say for many competitors. 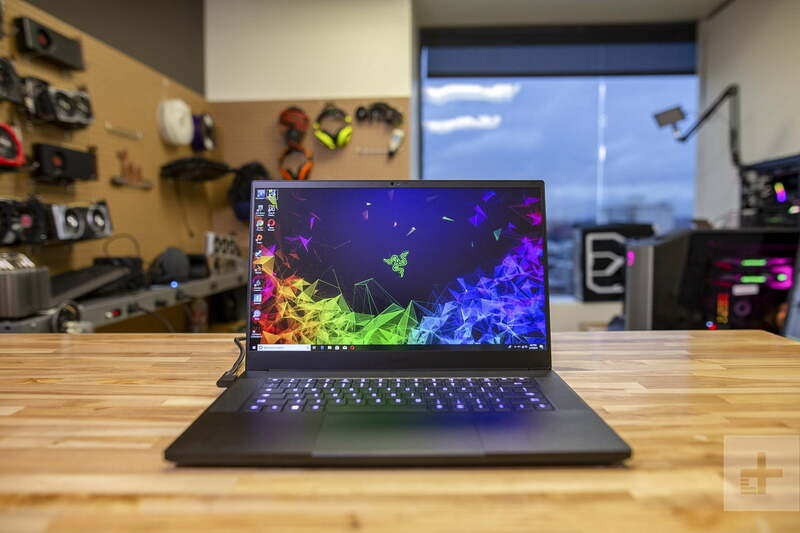 The Razer Blade uses Intel’s Core i7-8750H processor, a six-core CPU frequently found in gaming laptops and workstation-class laptops. It’s not the most powerful chip in the world, and the Razer Blade isn’t the fastest implementation of it. The Core i9-8950HK found in the Alienware 17 wins in Geekbench 4 across the board, while newer Whiskey Lake U-series chips win in single-core performance. A laptop like the Huawei MateBook 13 with its Core i5-8565U processor comes awfully close to the Blade, despite having just four processing cores. But benchmarks don’t tell the whole story. The Blade holds up just fine in our video encoding test, falling right in line with other gaming laptops. That speed can be felt just while using the laptop for multitasking and web browsing. Even with dozens of browser tabs open and multiple monitors screen, everything feels snappy, just as you’d expect. That’s what 16GB of dual-channel RAM and a six-core processor gets you. The super-fast storage doesn’t hurt either. The updated m.2 NVMe SSD gives quick read and write speeds, both hovering right around 1,800 MB/s in our tests. Ours came with the maximum 512GB of capacity, though a 256GB option is also available. Both the RAM and the SSD are accessible, which is great news for those who want to upgrade in the future. RTX. It’s the newest generation of Nvidia’s graphics cards, but does it offer significant performance beyond GTX? Well, yes. Whether or not it goes beyond what you think it ought to depends on your expectations, but there’s no question these are the most powerful Razer Blades ever made. It starts in benchmarks like 3DMark’s Fire Strike. It’s a GPU-intensive benchmark, and the RTX 2070 Max-Q flexes its muscle, providing a 17 percent increase over the GTX 1070 Max-Q. It achieves performance previously only possible in chunky laptops like the Alienware 17 R5 (which Digital Trends reviewed with a GTX 1080). There’s little the Razer Blade can’t do. With settings at Epic, Fortnite played at a smooth 90 FPS, while moving down to High will get you up to 137 FPS. The same goes for Battlefield V, which didn’t have a problem getting over 100 FPS on High and around 85 on Ultra. Tougher games like Assassin’s Creed: Odyssey pose a larger challenge, but nothing slowed down enough to be unplayable. Even Deus Ex: Mankind Divided made it over 60 FPS. The Blade doesn’t handle 4K well, but if you have a 1440p external monitor, you can get over 60 FPS in most titles. How does it compare it to last year’s model? Well, you’re looking at a gain between 15 to 25 percent, depending on the game. 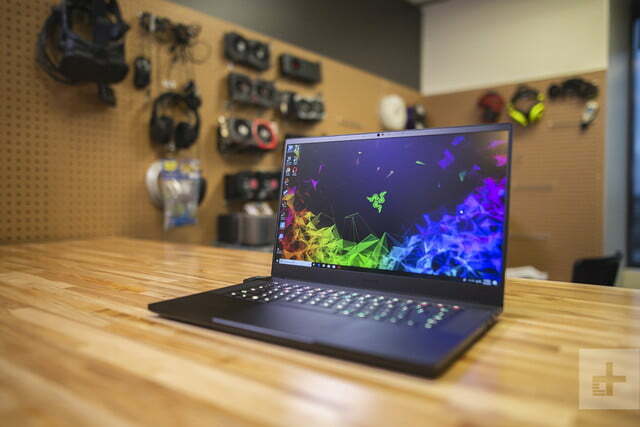 And here’s the best news; our review isn’t the most powerful Razer Blade available. The RTX 2080 Max-Q option, which starts at $3,000, is the top-shelf choice. The Blade still uses the “vapor chamber” heat sinks from last year’s model, which is meant to keep components cool without having to crank the fans. The Blade still gets hot, especially around behind the keyboard and near the hinge. I measured upwards of 112 degrees, which is hotter than what you’ll want to touch. Still, the system does a good job of keeping the WASD keys cool, as well as the palmrests. Internally, I never noticed temperatures over 83 degrees Celsius. The Blade is certainly throttling at times to keep these temps, but that’s to be expected with a chassis this thin. No, this isn’t the most powerful gaming laptop, but that’s never been what the Blade is all about. It’s about achieving the right balance of temperatures, fan volume, size, and gaming performance. The 2019 Blade again nails it. All-day battery life is an essential feature of a modern laptop. 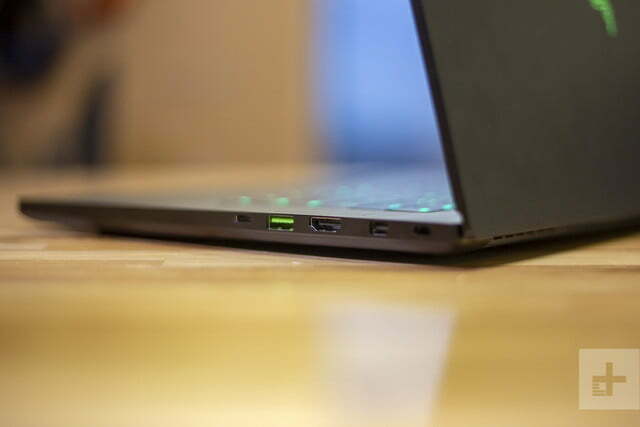 The Razer Blade doesn’t quite get there, but it runs circles around other gaming laptops. According to our tests, the powerful RTX card has taken a small toll on battery life. I wasn’t happy to see that, but it’s not enough to cause concern. I’m still seeing around five or six hours in moderate usage with the screen at 50 percent. The ROG Zephyrus S, by comparison, only lasts around two hours. I also ran it through our suite of battery tests to back up our anecdotal experience. Our most intensive test, Basemark, gave us just under two hours. That’s about what you can expect while playing games or running other taxing applications. Meanwhile, the Blade lasted six hours and fifteen minutes in local video playback. Not great compared to the fourteen and a half hours of the Dell XPS 15, but that’s to be expected when you put an 80-watt video card inside. The Razer Blade is expensive, there’s no doubt about. But because it takes the place of both a serious gaming laptop and a standard laptop you might use for work, the price is more bearable. The Blade isn’t just a great gaming laptop. It’s a great laptop, period. 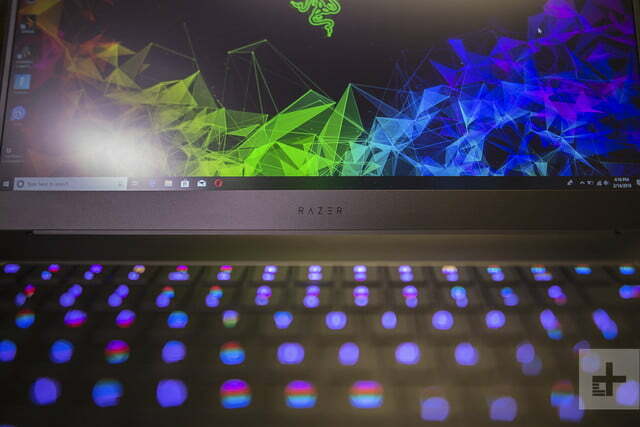 There are more thin-and-light gaming laptops than ever before. The MSI GS65 is a strong competitor, as is lightest RTX gaming laptop, coming in a few hundred dollars cheaper. Heck, even the Acer Predator Triton 500 is similarly thin. Even so, none of these have the premium look and feel of the Blade. If you are looking more for a video editing laptop and less interested in games, the Dell XPS 15 or Surface Book 2 might be good options. Yes. 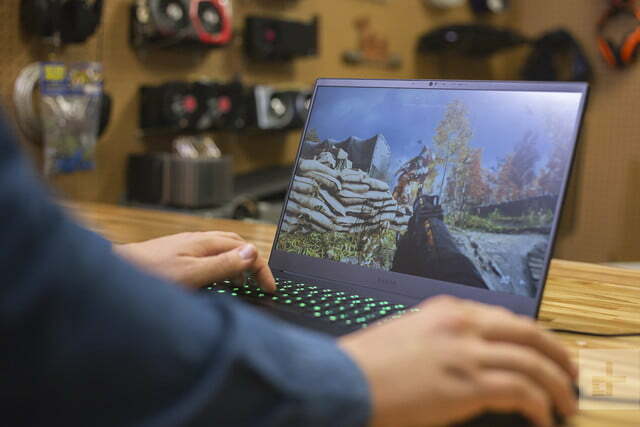 It’s the best gaming laptop you can buy and this year, it’s even better.